Need Cash? Have a Car Sitting Idle? Rent it Out with Turo. Need Cash? Have a Car Sitting Idle? Rent it Out with Turo. The sharing economy is on the rise, which has allowed many people the chance to capitalize on making money off of the things that they own. 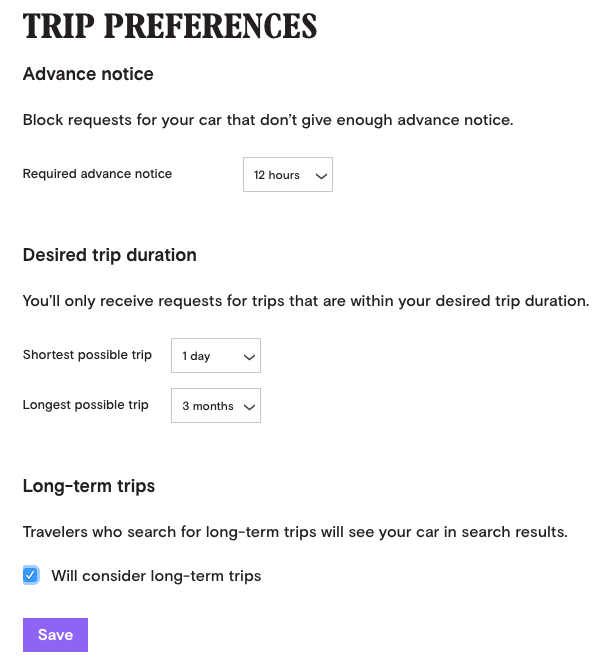 While AirBnB allows you to rent out a room in your home, or your entire home, another company called RelayRides has been allowing car owners in San Francisco to rent out their vehicles as well. They’ve recently changed their name to Turo and are now available in Boston, MA. In short, Turo is a new peer to peer car-rental community (like traditional renting, but better). There are other peer to peer car-rental companies out there, with one big difference being that Turo requires a 1 day minimum rental period. So, if you’re looking to rent your car out for a couple hours, this may not be for you. However, if you have an extra car you don’t use, work from home like myself, or are going away for a week, Turo sounds like the way to go. Click here to visit Turo’s website. So, how much money can you make using Turo? Straight from their website: Turo car owners receive up to 85%* of the trip price, delivery fees, and additional mileage charges. If the traveler did not pay for tickets or tolls during their trip, we’ll reimburse you for those charges after receiving the necessary documentation. 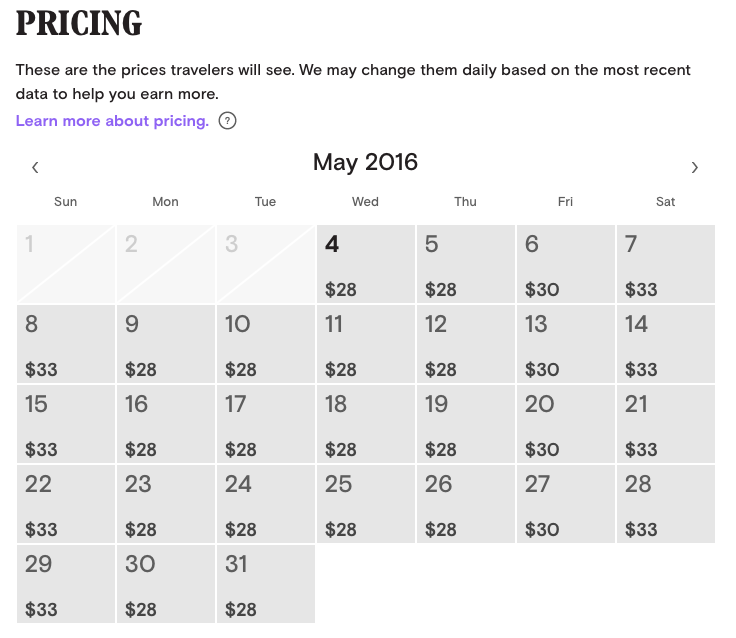 You can set your own daily price and you can also set prices for individual days. Additionally, you’ll be able to create a weekly and monthly discount. 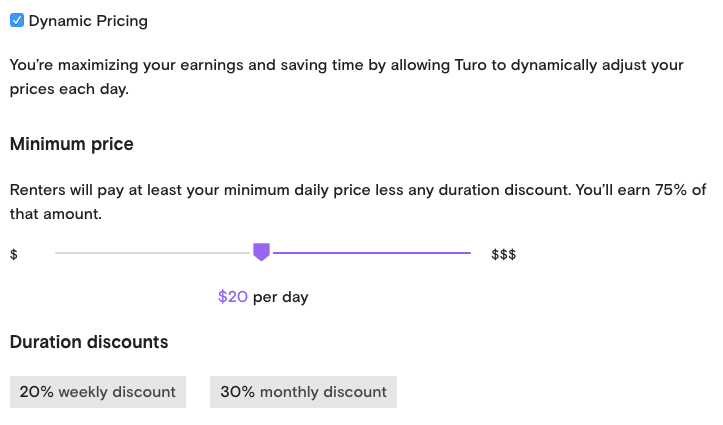 Alternatively, you can choose to have Turo dynamically price your car for you. 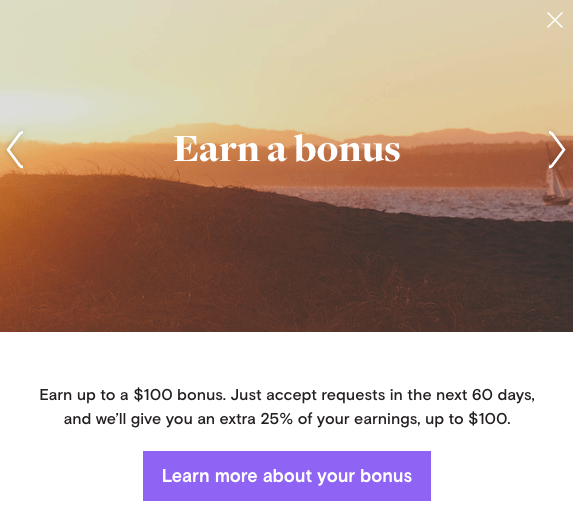 Earn more by offering delivery [to an airport or location chosen by your guest]. You receive 75% of the delivery fee. Because Turo’s insurance policy will cover you while you’re delivering the car, we’ll need you to verify your eligibility. As a general statement, income earned by renting your car is taxable. In the US, we will send 1099-K forms to all owners who qualify. What if the renter gets in an accident while driving my car? From the website: As a general statement, we believe that your insurance should not be affected. When you drive your car, you are covered under your existing policy. However, when a traveler uses your car through the Turo marketplace, we make available a liability insurance policy to protect both you and your guest. If the guest gets into an accident, our insurance policy will go into effect, which should leave your personal policy untouched. 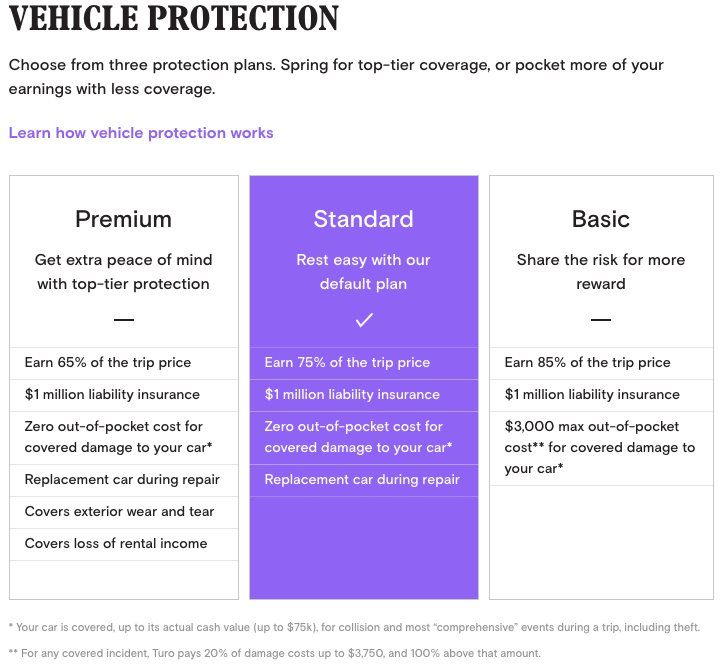 Your policy likely has a specific exclusion for coverage when you rent out your car, which is precisely why Turo has purchased this liability insurance policy for you. In addition, we provide protection for physical damage to your car, as described in more detail here. I personally signed up for Turo and submitted all of my vehicle information just to see how much I could make by renting out my car. I have a small 4 door car that’s 8 years old with 100,000 miles on it, but still in good condition. The front driver’s door lock recently stopped responding to the key transponder, meaning you have to manually lock the door, so I’m not quite ready rent my car out because I don’t trust somebody else to remember that and don’t want my car being stolen or broken in to (again). 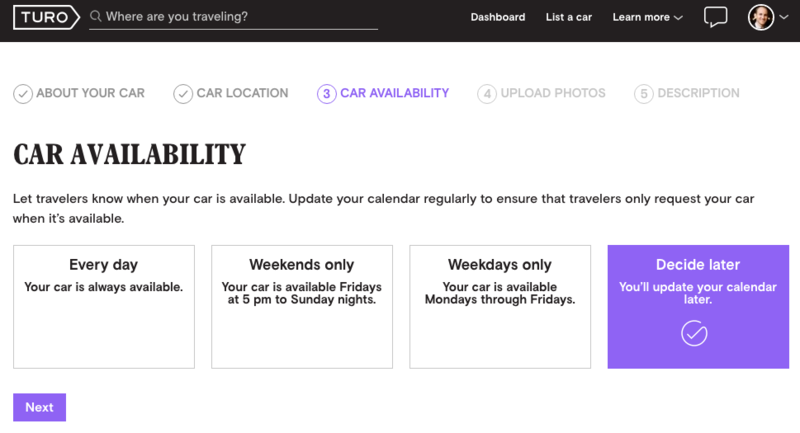 So when it asked about my car availability, I was happy to see that I could opt to decide later. Here are your default options to select from. Then it took me to my availability calendar and automatically showed me recommended prices to charge, using their dynamic pricing tool. If you have a nicer, newer car then I’m sure you’ll be able to charge a lot more than I can for my Mazda. According to their dynamic pricing, it looks like it would cost a renter about $208 to rent my car for a week. So, considering I would get paid up to 85% of that, I’d earn about $176 pre-tax in extra income for that one week of doing hardly anything beyond handing somebody my car key. If I got lucky and was able to rent it out for an entire month then I’m pulling in, approximately, an extra $700 per month pre-taxes. That could pay for all of my utilities (gas, electric, cable, internet, etc), or a chunk of my rent, some new clothes, or some fancy dinners out in the city. It may even be enough to pay for a Caribbean vacation via LivingSocial when I save up to 70% by clicking here. Ok, maybe I should be renting out my car! It even allows me to set my own pricing, mileage limits, trip preferences, and offers me a cash bonus. How Much $$$ Could YOU Make? We could all use a couple extra bucks here and there so if you’re interested in learning how much YOU could earn by renting out YOUR car, click here to try using their simple calculator. Then in the comments section below, let me know how much you think you could earn? Maybe you have a really sweet ride that would earn you a lot more than my car would earn me. From your calculator results, what would you spend the extra cash on? Share the amount of your savings and let us know! Maybe you’d buy your favorite collection of books, pay off a credit card bill, or even put it towards booking an exotic family vacation! This could be a game changer for a lot of people’s pocketbooks, and a convenient way to rent a car. 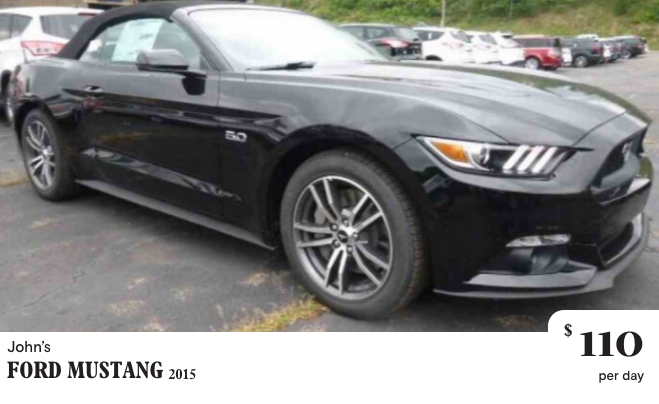 Should I Rent from Turo Instead of the big Car Rental Agencies? I was curious to see what cars are available to rent in Boston this upcoming weekend so I did a search and found over 130 vehicles available in the Boston area between 6:00 pm Friday and 8:00 pm Sunday. I could choose from anything from a tiny smart car, to a big pickup truck, to a corvette, BMW, and everything in between. 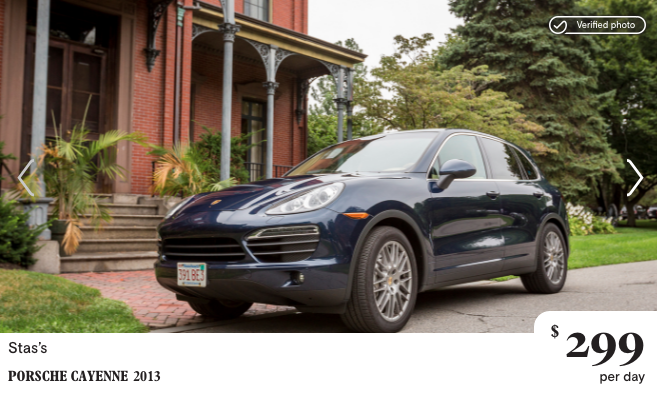 Just for example, perhaps I want to go on a road trip and want something more comfortable than my little Mazda, like this Porsche Cayenne. Or maybe I have somebody to impress and a luxury electric vehicle like this Tesla would help. The owner may even be nice enough to explain how I even power this thing, or give me a list of some electric powering stations he knows of. Or maybe the forecast is calling for 80 degrees and sunny blue skies and I’ll want to take an American made muscle car with a convertible top on a trip up the coast to Portland, Maine. Well, this Mustang looks perfect! Maybe the owner takes similar road trips and can give me some advice on routes to take and places to stop. Your standard car rental agency might not give you that personal advice. Whether you’re looking to make a few extra bucks by renting out your own car, or you’re looking for a more unique car rental experience, Turo is an option you won’t want to pass over. What do you think? Please leave any experiences with Turo in the comments section below. Thanks for reading Wicked Cheap Boston!